Home Lifestyle Catcalling and why it needs to disappear! Hi guys, it's Lauryn! 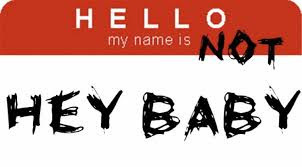 Ok so I'm back today with a bit of a rant post, you could say about catcalling. If you're unaware of what catcalling is, it is a whistle or a sexual comment to a passing person which is most definitely uncalled for. Now, men often think that by doing this, they are giving women a compliment but this is wrong! It is something that basically defines us as a sexual object... every part of this is disgusting. However, instead of people looking at this as being something that needs to be stopped, instead they focus on "over reacting, angry feminists" trying to put their point across. For a start, people who are against feminism just really do not have much sense honestly because therefore they are against equality and really people? Are we still in the 1950's? My worry is that we are still very much in somewhat of a patriarchal ideology, no matter how much people deny it. Honestly, I do not blame all men as like I have said before, I will not scapegoat a whole population but I can not just sit here and pretend that every man knows that it is wrong to treat a women as though they are a sexual object and are only here to fulfil their sexual desires. This was proven to me a few weeks ago when I decided to go for a walk and I'm not even off of my street when I get catcalled by two men that are probably older than my grandparents! Honestly, I don't understand how this generation is supposed to progress when their role models are people who act in this way. It's actually quite worrying. 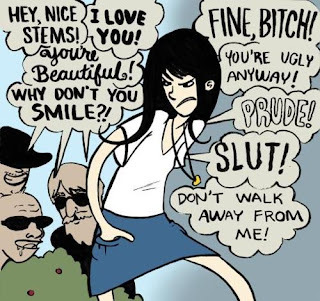 Especially considering the younger generation are so easily influenced by what everyone else is doing so therefore, if they see an older person making unnecessary sexual comments towards a female, they may see this as "cool" to do and then the cycle continues meaning that females will never be able to escape being sexualized. What's even worse about this is that if a women is catcalled, it is then referred to as being "her fault" because of the way she was dressed or acting. It sounds ridiculous, doesn't it? But oh, it's the sad truth of this world. Women should be able to dress and act in whichever way they want without being blamed. Have people ever thought that it's actually the way that people are thinking that is the problem here? Not the way a women decides to dress. Then, if a women expresses discontent towards being sexualized, she is treated negatively as though they should be grateful for an unknown man saying these things. WHY? It is common for a man to cat call when he is a group of friends rather than when he is alone to act "cool" in front of them. THERE IS NOTHING COOL ABOUT THIS, STOP. As well as this, a lot of the time these females can't even be classed as "women" because they are young females in school so they are being sexualized before they have even reached puberty. Please tell me what is sexual about a young girls legs or shoulders? This is linked to how girls are often asked to change their clothing in schools if they are wearing vest tops or shorts because apparently it's "distracting" to the male teachers. Surely, they just shouldn't employ male teachers that are distracted by young girls skin? I'm aware that this is going to cause a lot of controversy so please feel free to let me know your opinions! The real question here is why should females grow up in a society where they aren't allowed to wear certain clothes and they have to live in fear of being catcalled and sexualized? So, that's the end of today's post! Yes, it definitely turned into a bit of a rant but I hope you enjoyed reading as much as I enjoyed writing. As always, if you have any queries, suggestions or just want to say hi, please feel free to contact me and as always all of my contact information will be below.